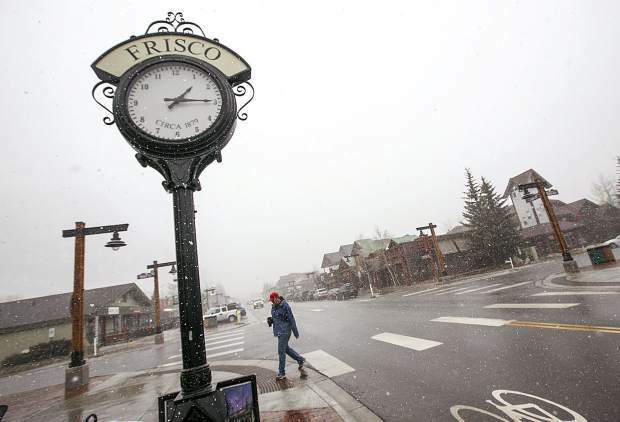 Snow arrives Main Street in Frisco Tuesday, April 17. 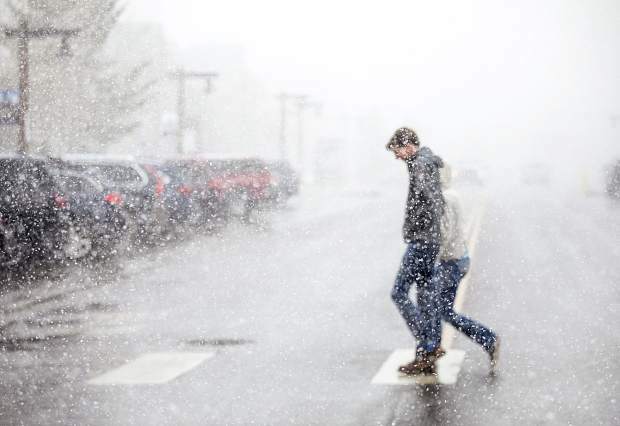 A pedestrian crosses Main Street in Frisco as snowfall arrives Tuesday, April 17. 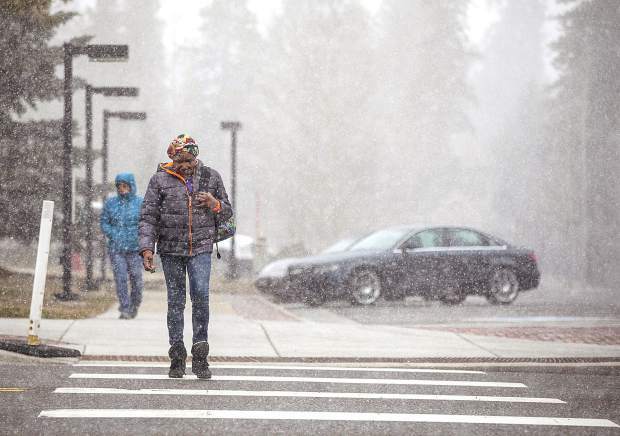 Pedestrians cross Main Street in Frisco as snowfall arrives Tuesday, April 17. 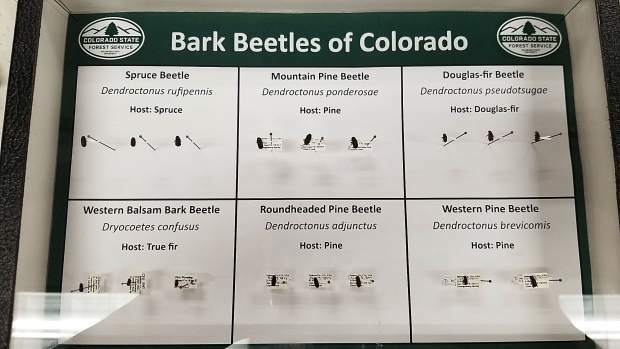 Spring continues to offer a winter’s bounty as another significant storm is expected to hit the mountains this week, dropping at least a few inches of snow across the High Country Thursday evening into Saturday. Meteorologist Joel Gratz of OpenSnow.com posted his latest predictions Tuesday morning indicating a southern shift to the storm he’s been tracking for the past few days. This shift would put Summit in the dead center of powder heaven, with up to 8 inches of snowfall possible across the county. 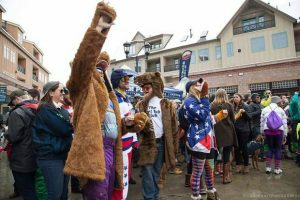 Snowfall will begin Thursday evening, Gratz said, and “bring spotty and potentially intense snow showers to all mountains.” Gratz expects Saturday to be the best powder day with some hope of good snow to work with on Friday afternoon as well. However, Gratz cautioned that storm shifts have produced inconsistent weather models, which means his forecast is a bit more uncertain than it was a few days ago. Regardless, Gratz expressed confidence that there will be a fair amount of snow to go around. 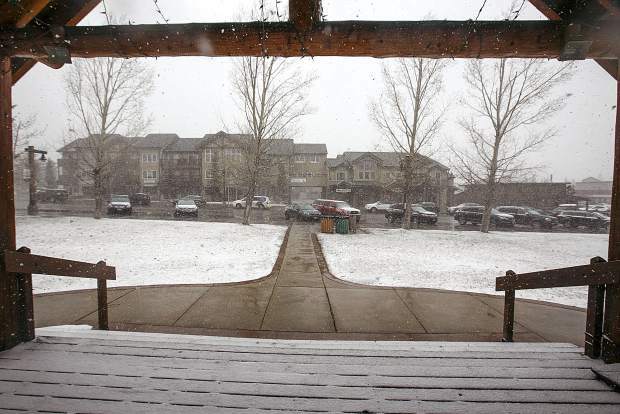 The National Weather Service offered a “hazardous weather outlook” across the region Tuesday, citing high wind warnings and fire danger on the Front Range and snowfall in the mountains ranging from 2 to 4 inches Tuesday evening. The NWS also predicted “moderate snow amounts” with the storm from Thursday through Saturday. 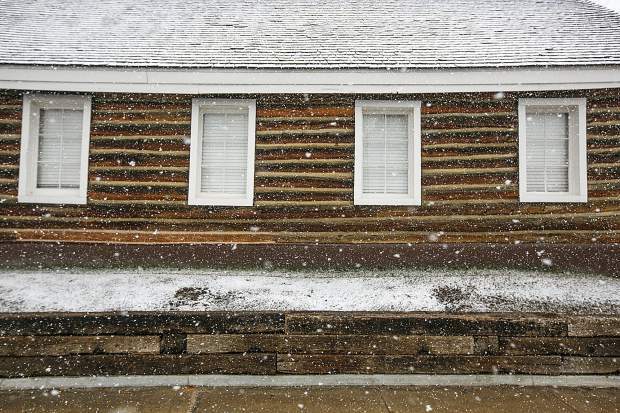 The continuing spring snowfall is welcome news across the state. Colorado had the third driest winter on record, and snowpack levels are below average in all but the Laramie and North Platte river basins in the north. According to the SNOTEL snow survey, the Upper Rio Grande basin in the south is at 32 percent of normal snow levels. While this current storm won’t do much to alleviate the dry conditions in the south, any precipitation is considered a bonus with an uncertain weather pattern in the future. Significant moisture may help raise the fuel-moisture index, a gauge for the likelihood of wildfire. More precipitation will help stave off early spring wildfires in the High Country, and help towns continue to advance fire mitigation efforts ahead of the dry season. 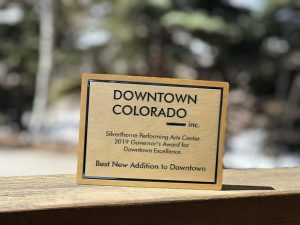 The snowfall also comes as Breckenridge Ski Resort closes for the season on Sunday, with Keystone Resort and Copper Mountain Resort having already closed over the past couple weekends. 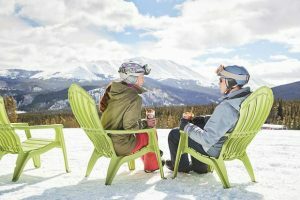 A-Basin is expected to remain open for at least another month, while Loveland will close on May 6.